Each has a different & unique question-paper. Questions are different, so are the answers! The invigilators gauge our preparation. Sometimes in the future not so distant. Do we feel equipped to give our best? Are we ready to appear every test with zest? Do we learn and add to our knowledge's chest? Prepared to take a tougher version of the test? How do you deal with the exams in life? Please do share. Checking in from the A to Z Challenge. I got a little bit of anxiety just reading this poem. Exams are tough but I am usually over-prepared for them because of test anxiety. Wow, good use of the word 'invilgator'. The every word is enough to cause anxiety! 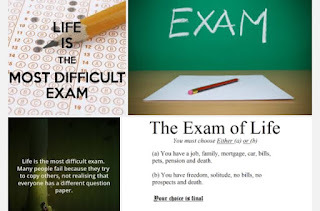 Everything in life in an exam. Glad there is no pattern and we are free to give it our own way. Loved how you have written about exams in a different context. From a teacher's point of view, exams are a necessary evil. I've had to take a written one recently, and no matter how much you prepare, the nerves will always be there and you can only hope that your preparation is enough to see you through. Truly Ria. Right preparation can see us through. We can emerge with flying colours! Teachers have to work hard in correcting & scoring answer-sheets.